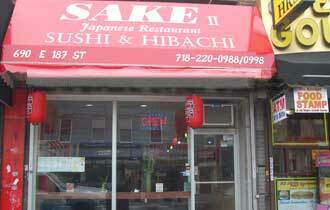 We are adding Online Order service to Sake Japanese Restaurant in Bronx, New York. You can now online order your favorite Sushi, Hibachi, Roll and others Japanese dishes We provide fast and Free Delivery(Minimum Order:$10.00, within 1 mile). We deliver to Rose Hill Campus, Fordham University, Bronx, New York. University students are very welcome to try our online order service. We have special sections on our online menu for university students. We delivery to Rose Hill Campus, Fordham University, Bronx, New York. Located at 690 E 187th Street, Bronx, New York, our restaurant offers a wide array of authentic Japanese dishes, ranging from traditional dishes such as Rainbow Roll, Salmon Teriyaki, Sushi Deluxe to new style entrees such as Godzilla Roll, Hibachi Seafood Deluxe, White Fish Teriyaki. Try our food and service today. Come in during our lunch hour (11:30 am - 3:00 pm) for a Lunch Special or during evenings for a delicious Japanese dinner. You can also online order your favorite Japanese Food for take out or delivery. Our goal at Sake II Japanese Restaurant is to provide an unforgettable dining experience for all our patrons.